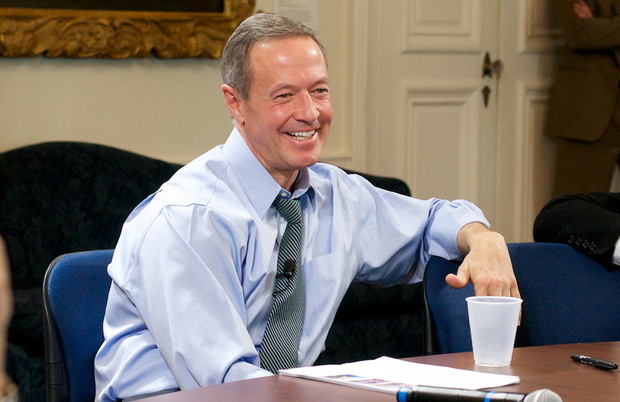 The O’Malley years: Tough choices, but good choices or bad? Martin O'Malley in his last press conference with reporters as governor. Will Maryland Gov. Martin O’Malley be remembered as author of the biggest tax increases in Maryland history or the biggest spending cuts? Did he preside over the most businesses shuttered in the Great Recession or add the most people to the health insurance rolls and provide the biggest increase in school funding? Despite covering politics in Maryland for almost 40 years, O’Malley is the first governor I’ve covered front to back, from my first interview with him for the Baltimore Examiner in 2006 to his exit interview Friday. The first interview with Mayor O’Malley was in a small room in a make-shift Canton campaign office with another Examiner reporter and a staffer. The last on Friday was a huge confab in the Governor’s Reception room with at least 17 reporters, eight TV cameras and a coterie of staff. Gov. Martin O’Malley concludes interview with reporters Friday. Friday’s interview was particularly unsatisfying as all the broadcast reporters clamored for attention, with special focus on the question of whether O’Malley was running for president. Hasn’t this been reported, especially by Post reporter John Wagner, who has had dozens of stories about O’Malley’s presidential ambition? While it may have been reported in print, I realized I had never seen or heard O’Malley actually say it on TV or radio — at least not local TV and radio. Without sound or pictures, his ambition wasn’t yet official in Maryland. He was repeatedly asked about the 2016 race in different ways. Will the election loss of Anthony Brown hurt his chances? Will his data-driven approach to governance work in the White House? O’Malley said he’s challenged by communicating his governing successes, and even posted one of his Letter to Maryland blogs about the communications challenge last Tuesday. He has repeatedly talked about the “tough choices” he’s had to make in the prolonged recession. But were they good choices as he sincerely believes? Or were they bad choices costing jobs and businesses, as Larry Hogan maintained in the campaign? O’Malley made the case for his “record on fiscal responsibility” in a one-page sheet making eight points he handed to reporters. Most of the points were made more graphically in a PowerPoint presentation Jan. 7. All are true. But a governor’s influence on high incomes is certainly questionable, unless you tie it to good schools and economic opportunity. O’Malley complained that Education Week “dropped three of [the scores] that we were best in” in order to let other states win. What the magazine did was emphasize outcomes for students, rather than education policies. This pushed Maryland to third place behind Massachusetts and New Jersey. There are other business rankings that put Maryland in the middle or at the bottom for business climate, such as one by the Tax Foundation. This is expressed as a percentage, and it seems to be accurate. But as a smaller state, Maryland starts out with a smaller employment base. Virginia and Pennsylvania have created more jobs than Maryland, but at a slower rate. This is the cumulative scorecard O’Malley has often repeated. It yet again distorts the record. Yes, O’Malley has indeed cut some parts of the budget, especially in midyear as he did Jan. 7. He has furloughed employees (temporary pay cuts), eliminated mostly vacant jobs, frozen hiring, and required state workers to pay more into their pensions and health benefits. But the overall state budget went from $29 billion when he took office, to $38.5 billion today, $9.5 billion more. That’s not a cut. O’Malley prefers to focus on the general fund budget (see #4), but even there spending went up. What O’Malley did do was ask the legislature to change the funding formulas that would have required him to spend more on services than the state took in. He and the lawmakers did have to make “tough choices” about which promises of increased funding not to keep, but they had no choice but to deliver a balanced budget. More conservative accountants have insisted the budget is not truly in balance. True enough, and a better record than any governor in the last 40 years. Despite having defeated the man twice at the ballot, O’Malley can’t seem to get the previous Republican governor off his mind. Pointing at the Ehrlich portrait on the wall. O’Malley also pointed out that the Ehrlich term (2003-2007) was “the only time where we were underperforming Virginia every year” in job growth. Also true — since it doesn’t count state colleges and universities, where most of the job growth occurred, or the school systems that got huge increases in education funding, allowing them to add more teachers and administrators. True. The bond houses frequently credit Maryland’s prudent fiscal management, balanced budget, 15-year bonds and its willingness to tax its citizens. But the bond raters remain cautious about Maryland’s high debt, which increased under O’Malley, and high pension liabilities, which O’Malley has tried to cure. This is based on federal figures, which place Maryland’s state and local taxes in a tie with Missouri and Texas at 13.1%, and only slightly higher than South Dakota, New Hampshire and Tennessee. But Maryland has higher household income ($73,238) than all those states — $21,000 more than Texas, $26,000 more than Missouri, $30,000 more than Tennessee, $8,000 more than New Hampshire, $24,000 more than South Dakota. Residents of those states may pay a similar percentage of their incomes in state and local taxes. But Marylanders pay a lot more in taxes, and generally a lot more for housing and other goods. “Recent budget actions continue fiscal responsibility,” referring to the Jan. 7 action by Board of Public Works. But these budget cuts also continue the transfers from special funds — such as Program Open Space — that Hogan has criticized. O’Malley talked about a lot of other issues in his exit interview, but these eight points try to counter many of the charges made by Hogan during the campaign about taxing and spending. It is a case that O’Malley implied the Brown campaign should have made more strongly in defense of the administration’s record of “investing” in education and health care, even though campaign consultants argue against it. It hardly sums up the O’Malley years, but it makes the case that he made the right choices for the right reasons. It will be up to Larry Hogan to prove him wrong.